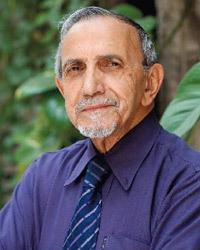 Ebrahim Alkazi (b. 1925) has received several awards, including the Sangeet Natak Akademi Award for Direction (1962) and three Padma awards: the Padma Shri (1966), for distinguished service; the Padma Bhushan (1991), for distinguished service of high order; and the Padma Vibhushan (2010), for exceptional and distinguished service and his contribution to the Indian arts. Alkazi is primarily known as one of the country’s leading post-Independence theatre directors and a patron of the arts. A theatre director of profound insight and fastidious taste – shown to full advantage during his years in Mumbai with the Theatre Unit from 1950-1962 – Alkazi, as head of the National School of Drama & Asian Theatre Institute from 1962-1977, built it up into a truly national institution with a breadth of outlook that embraced the classical Sanskrit drama, traditional and folk forms, contemporary Indian drama in the regional languages, and Western drama from the Greeks to the present day. He introduced cutting-edge training methods, academic rigour, technical discipline and international standards in an attempt to professionalize the already-vibrant Indian theatrical scene. The NSD’s Repertory Company, founded by Alkazi, took these plays to the far corners of the country, building up a new awareness, taste and sense of artistic responsibility in the theatre profession and with the public at large.Equally formidable has been Alkazi’s contribution to the appreciation and encouragement of contemporary Indian art. His monumental series of 13 exhibitions in Mumbai in the 1950s, titled This is Modern Art, opened up a new world of awareness and understanding for the serious student of art and the layman. From 1977 onwards, he became a determined promoter and patron of related aesthetic endeavours, especially in visual arts. As Director of the Art Heritage Gallery in New Delhi, Alkazi was among the first promoters of modern artists such as Maqbool Fida Husain, Tyeb Mehta and Akbar Padamsee. The Alkazi Collection of Photography at the Alkazi Foundation for the Arts, New Delhi (founded in 2006) is one of the world’s largest private collections of historical photographs, cameras, maps, negatives and documents. Its emphasis is on 19th- and early 20th-century images of India, Myanmar (Burma) and Sri Lanka. Alkazi, a great collector, is also an integrator, striving to connect the world of aesthetics and education, along with the visual, documentary and performance arts.